Carbon finance offers the potential to change land management and conservation planning priorities. We develop a novel approach to planning for improved land management to conserve biodiversity while utilizing potential revenue from carbon biosequestration. We apply our approach in northern Australia’s tropical savanna, a region of global significance for biodiversity and carbon storage, both of which are threatened by current fire and grazing regimes. Our approach aims to identify priority locations for protecting species and vegetation communities by retaining existing vegetation and managing fire and grazing regimes at a minimum cost. 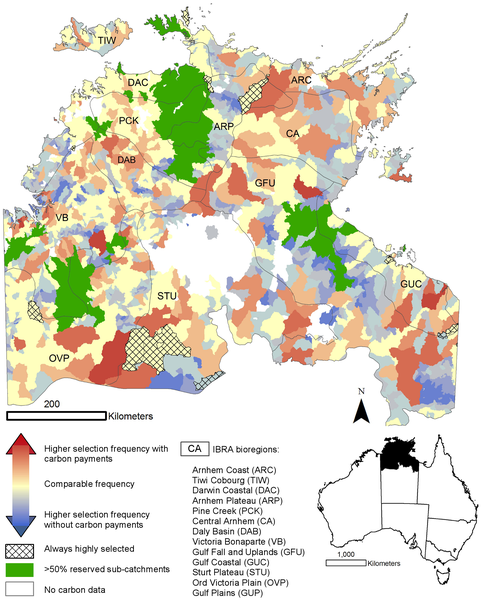 We explore the impact of accounting for potential carbon revenue (using a carbon price of US$14 per tonne of carbon dioxide equivalent) on priority areas for conservation and the impact of explicitly protecting carbon stocks in addition to biodiversity. Our results show that improved management can potentially raise approximately US$5 per hectare per year in carbon revenue and prevent the release of 1–2 billion tonnes of carbon dioxide equivalent over approximately 90 years. This revenue could be used to reduce the costs of improved land management by three quarters or double the number of biodiversity targets achieved and meet carbon storage targets for the same cost. These results are based on generalised cost and carbon data; more comprehensive applications will rely on fine scale, site-specific data and a supportive policy environment. Our research illustrates that the duel objective of conserving biodiversity and reducing the release of greenhouse gases offers important opportunities for cost-effective land management investments. A comparison of the difference in selection frequency, a measure of investment priority, between scenarios 1 and 2.